Bramell, Party of Five: Knock Knock. Who's There? HAM! GREAT giveaway! I signed up for the Newsletter (what's one more newsletter?........and I may get some great ideas, recipes or coupons from it). I hope you decide to SHARE! I'd have some baked beans and maybe some potato salad and deviled eggs with mine. Save the ham bone for a yummy pot of beans on another day! I signed up for their newsletter. I'd have it with Granny Smith apples in a Dijon mustard glaze with scalloped potatoes. Yummy! I signed up for the newsletter! I would make my homemade baked beans, creamy mustard potato salad & my famous deviled eggs. Dang, now I'm hungry. Signed up for Petit Jean's newsletter. I love hashbrown casserole, green bean casserole, deviled eggs and fruit salad with ham. I signed up. I would probably make potato salad and/or a cheesy broccoli casserole to go with it. I signed up (I actually I already was, but what the heck!). 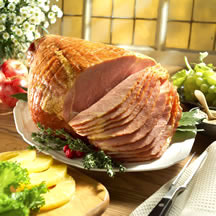 I lovelovelove ham. Love ham. I LOVE HAM! I'd do some sort of fruit glaze, and make some creamy mashed potatoes to go with that baby. Please let me win! I signed up~ I would make my Mom's Scalloped Potatoes recipe! signed up. Day old mashed potatoes and green beans would go well! yummy! I signed up for the newsletter. I would make a hot pineapple side dish...it's so yummy that it doesn't even need a real name. I'll even share it with you for your next ham!